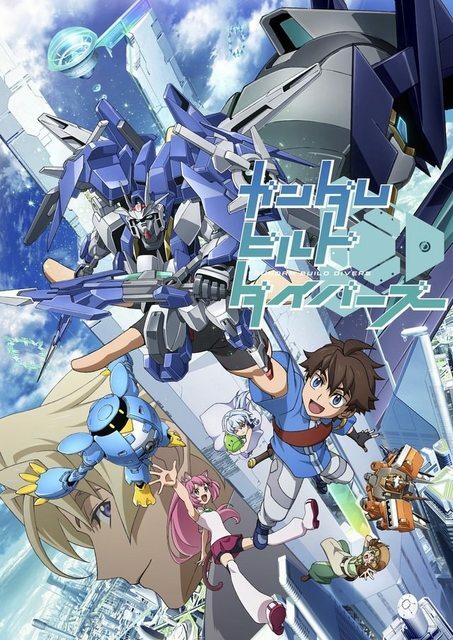 Welcome to the discussion thread for Gundam Build Divers, Episode 25. Raw requests and offers are not permitted anywhere on this forum. Spoilers or hints about future events must not be posted in this thread. If you need to reference something that would spoil a future event, reply directly with a private message, or seek out a more appropriate thread. Discuss your expectations of the episode if it has not aired yet. Please try to keep the discussion on-topic. Do not post multiple times in a row. Please edit your existing post if you wish to add additional thoughts. Any comment that discloses events, characters, plot or other information before it is revealed in the anime is expressly forbidden whether or not it is behind spoiler tags. Spoiler tags should still be used where appropriate. Please consult the AnimeSuki Spoiler Policy for more information. on the "Quick Reply" and "Reply to Thread" forms. Make sure that you include a useful title! locate and deal with problems quickly. Posting inappropriate spoilers may result in a ban. Note: Reporting a post does not mean the poster will be banned instantly. The Moderators will use bans if warnings are repeatedly ignored. not sure its considered amazing that the side story manga characters cameos are fully voiced as well. Hmm well passable end i think, kinda rushed tho, and that ariadne new server tho, IBO? well lets see what will SUNRISE/BANDAI will make another build series after NT or not. This size of this sig is beyond what A-S permits. When it comes to AU, I think this is the first time side-story characters/mechas made cameos in the core AU-series complete with their voices. Not even Astray characters have that privilege in SEED/Destiny (eg: Shiho Hahnenfuss appeared in Destiny but never voiced). Instead, Sunrise made two short anime for Astray. That was pretty much the ending we expected. It was fun to see what the other characters look like in real life. Really disappointed we didn't see Rommel! It's an okay ending to an overall mediocre series. At least we got to see most of the character in really life. Leaving out Rommel is a crime though. With any luck, this'll be the end of the build franchise. Aint gonna happen, the series is too easy to milk for an easy buck. Though I do prefer if they step back a bit, assess what they did wrong, and improve. First off I would like to say that almost nothing about the game side of things made any sense. With that out of the way that was about as good an ending as they could have made with what they had to work with. I did find all the apologizing about stopping a murder attempt rather hard to take. I think the overriding problem with the show was that they wanted to make an inherently consequence-less situation (an online MMO) have real world consequences and went about doing it in the most wrongheaded way possible. so what happened to Nanami's custom gunpla? Ya, I really wanted to see what he looked like and also why that one subordinate of his said this was all he had. You know that's exactly what happened here with the 00 Diver Ace, though, right? Murder is bit strong word and honestly risking all game data for what basicaly amount to glitch is certainly rather reckless and if GBD support microtransaction, it could get really nasty. So I think apology wasn't completely unwarranted. We can argue whether Sara is really alive, but I don't think there is point to it as there is no way prove either. How would I have written GBD? Well for starters, I'd have Riku and friends go through a lot of agonizing defeats and slowly/gradually climb up the ranks as his team improves and grows in skill, maturity etc. The Sarah story really didn't make sense and everything leading up to the final battle to save her was a complete waste of writing. I would have just kept her as an in game creation that wasn't harmful at all, but since they insisted that she caused the break decals, then why the f*** are we seeing the problem being dealt with from an online perspective and not from an offline perspective? There should be an entire IT team dedicated to these issues in the real world, not within an imaginary world. Maybe if they wrote it like Yugioh VRAINS where your virtual actions actually have real world consequences, I might have given them a pass on that. I think it would have been a far more interesting avenue to strike a better balance between real world and virtual world personalities. Maybe meeting some of these ppl in real life at the end of the series is a set up for a season 2, but in reality, this virtual game could have been played globally. Does everyone else live in Japan? Because it seemed only the insanely rich guy flew all the way to meet the kids. What I liked about the first GBF was besides the fantasy aspect of the 2nd main character coming from another world (they could have explored that further), everything else was based on the real world. We had proper bars and levels set on the different nationalities and players participating in the tournament. It was more or less consistent to what they said initially from beginning to end, and the growth of the protagonist was believable. Alas, this GBD series has come to an end. Time to move on. You know considering how bad this was its probably good it wasn't really connected to GBF might limit brand damage. You know GBD is bad when the plot in Yu-Gi-Oh! Vrains makes more sense.